Born in 1962, Andrew Lumsden was educated at Winchester College and The Royal Scottish Academy of Music and Drama before going up to St John's College, Cambridge as Organ Scholar. Whilst there, he was assistant to Dr George Guest in training the Choir and in playing the organ for services, concerts, broadcasts, and tours. 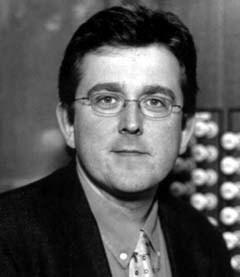 After three years as Assistant Organist at Southwark Cathedral, he was appointed Sub-Organist at Westminster Abbey, where he played the organ for many important national occasions, including the 50th anniversary of the Battle of Britain and memorial services for Lord Olivier and Dame Peggy Ashcroft. He was a regular broadcaster on the BBC's Daily Service and Choral Evensong and also appeared in the English National Opera's production of Busoni's Dr Faust. Andrew Lumsden took the position of Organist and Master of the Choristers at Lichfield Cathedral in 1992, a post he has combined with regular recital work at home and abroad. During his time at Lichfield, the Cathedral Choir recorded five CDs and toured France, Germany, Italy and visited Washington DC. The Choir appeared regulary on radio (Choral Evensong, Daily Service and Radio 4's Morning Service) and television and, in December 1998, it broadcast no fewer than eight times (seven live, one recorded) in four weeks, including a highly acclaimed series of four live TV programmes for BBC1 on all four Sundays in Advent. The choir also appeared with Dama Kiri te Kanawa and Sir Simon Rattle. While at Lichfield he also conducted the Cathedral's Speical Choir which premiered new commissioned works from Malcolm Archer and Paul Spicer. In September 2002, Andrew left Lichfield to take up his appointment of the Director of Music at Winchester Cathedral; he was awarded an honorary FRCO in 2003. As a soloist, he has appeared with the LPO at the Royal Festival Hall, the ECO at the Barbican, and the CBSO in Symphony Hall. He was the one of the youngest people to broadcast a solo recital on Radio 3 (he was 17 at the time) and he frequently tours abroad - recital venues have included such diverse places as Bergen, San Francisco, Harare and Sydney. His hobbies include wine, cricket, and travel, particularly flying, and one of his long-term ambitions is to gain his private pilot's licence.